Renters who are renting by the month shall pay in advance and on the day of the month that you arrived on. Rates will be prorated when necessary. Every day late past 5 days a late fee of $5.00 will be assessed per day. By entering the park, you accept full responsibility for injury, accidents and loss or damage of personal property for any cause or reason and hold ownership and management harmless. SPEED LIMIT IS 10 M.P.H. ALL VEHICLES ARE TO BE IN THE CAMPSITE OR PARKING AREA, NO PARKING OR DIVING IN THE GRASS! NO ECEPTIONS! Pets are allowed, but must be accompanied by owner when outside. YOU ARE IN THE CITY LIMITS AND THERE IS A LEASH LAW. ABSOLUTELY NO SWIMMING IN THE POND. THE PARK QUIET TIME IS BETWEEN 10 PM AND 8 AM. There is to be no ATV riding in the park without permission. Unruly conduct, drugs or intoxication will be cause for immediate removal from the park. If the police are called on you, you will be asked to leave unless a plausible reason is presented. Fishing is permitted in the pond, all children under10 will be accompanied by an adult while fishing. There will be no major mechanical work or oil changing performed in the park unless permission from park management is received. Permission must be received to wash your R.V. or personal vehicle. 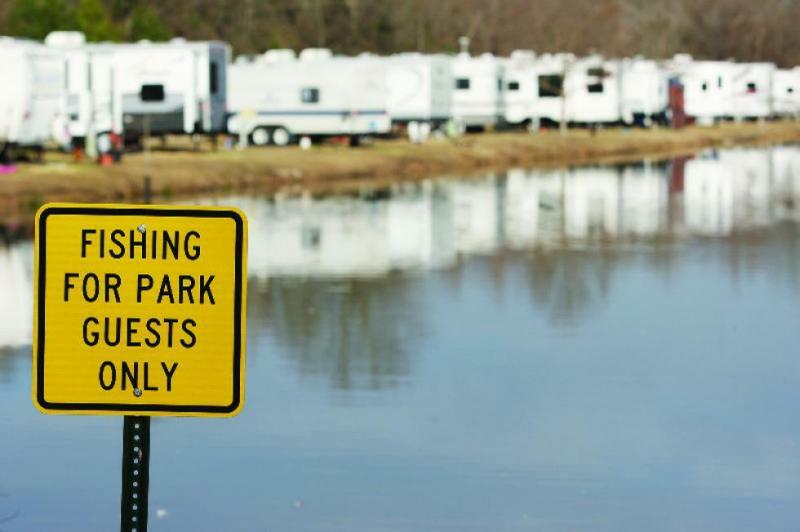 If complaints are received from other residents against any one individual, park management reserves the right to either evict or move the individual to another campsite in the park, depending on the severity of the situation. RV’s will comply with City and State Codes, in other words, your RV must have approved sewer, water and electric connections. If your RV does not comply, you will be asked to leave. Management reserves the right to refuse service to anyone and may ask a guest to leave at any time. Place all garbage and litter in dumpster located near the entrance. NO OPEN FIRES- except in metal grills or in fire rings approved by Management. No Fireworks or firearms to be shot in the park. Alcoholic Beverages are allowed in Campsites in Moderation. This is a Family Oriented Facility. You will be held responsible for your behavior. You are responsible for the conduct and driving of your guest and will be held accountable for them. Rates Rules and Policies are subject to change without notice and is the sole discretion of management. Refunds are at the sole discression of Park Management. Copyright 2011 Gator Den RV Park. All rights reserved.